On Good Friday I had been invited to Fräulein Frauke's and her husband John-Paul Bichard's yearly Easter party. 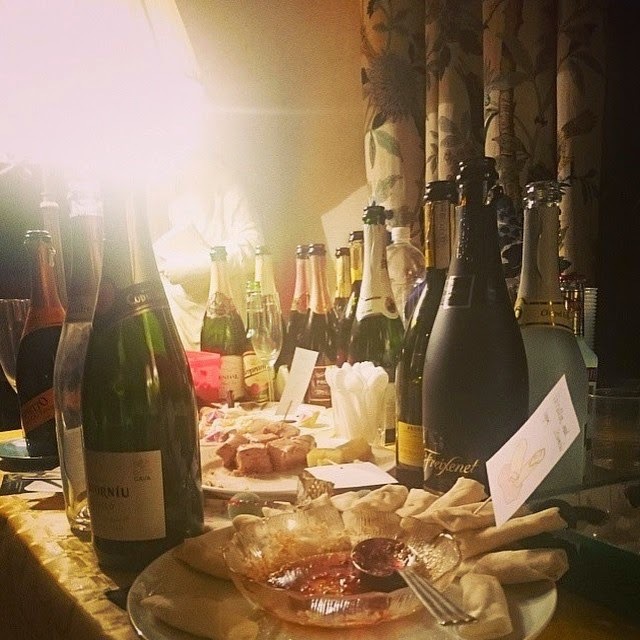 Every guest brings something for the buffet, and a bottle of bubbly, and then we just share everything. I made loads of dark chocolate mousse! Everyone always dress up for this decadent party, so I though it was a good idea to premiere a dress I got for my birthday last August, but still haven't had an opportunity to wear - a vintage gown from the 40s! ...that is gathered in the back to create a small train. At the waistline sits a sort of belt that closes in a big bow at the back. The edge around both the neckline and the bottom of the belt is scalloped. I love this dress because it seems so different from other 40s gowns. The design of the dress is very elegant, like a ball gown. But then whoever made it used this "simple" plaid fabric that probably would have fitted a day dress. So it feels like I can wear it to both fancy parties, and just for afternoon tea.